﻿This award-winning, mixed Jazz quintet hails from the West side of the Center of the Universe -Manhattan, NYC, of course! Accolades include winning the Mid-Atlantic Harmony Sweepstakes, Audience Favorite and Best Arrangement, and garnering two CARA nominations for Best Jazz album and Best Jazz Song. West Side 5's music was featured on "Voices Only Forte" and their live performance featured at Gracie Mansion for Mayor Bloomberg. 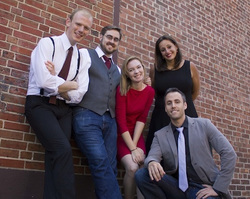 Often compared to artists like Manhattan Transfer and New York Voices, West Side 5 combines lush, Puerling-esque chords with a vibrant swing sensibility. Whether they're scatting through the scales, crooning classics, or amazing audiences with their vocal "horns", West Side 5 knows just how to keep it hot while sitting deep in the pocket. 6:55 pm HS Champions ONSTAGE HS champions will take stage in dark. Emcee will intro group at 7 sharp and HS Champs perform 1 song immediately. 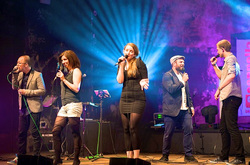 Postyr Project is a five-part group out of Denmark. Their award-winning music explores the border between the passionate expression of the human voice, and the uncompromising edge of electronic music. Postyr Project won 1st prize at the Tampere Vocal Music Festival in Finland, and were nominated for 3 CARA and 4 ACA awards. The group emerged from two award winning groups, the rhythmic choir, Vocal Line, and the vocal group, Vox 11. 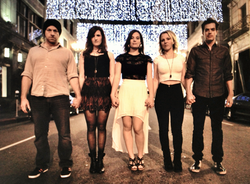 They've shared the stage with Bobby McFerrin, The Real Group and countless others, and they are excited to make their debut at SingStrong.